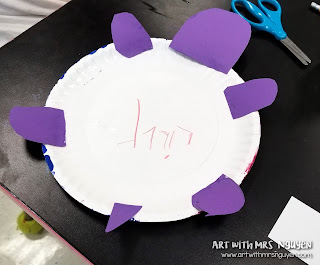 I'm going to go ahead and start by saying that kindergarten is seriously the hardest grade-level for me to plan lessons for - so thank goodness for Pinterest, Instagram, and my fellow art educators! 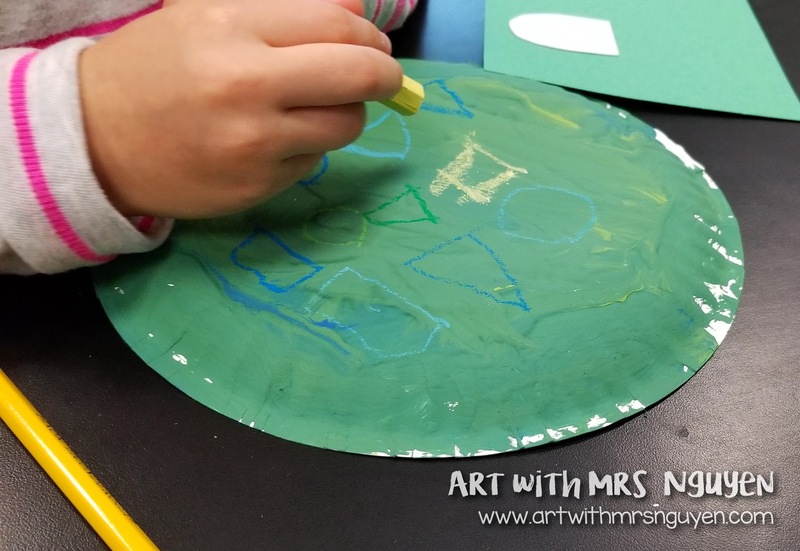 This particular lesson was inspired by a pin that I found on Pinterest from Art with Ms. Pinaire. You can also find her on Instagram here. To begin, I reviewed with my kinders what they had learned during their last rotation with me about color mixing. What's so special about primary colors? Oh yea! 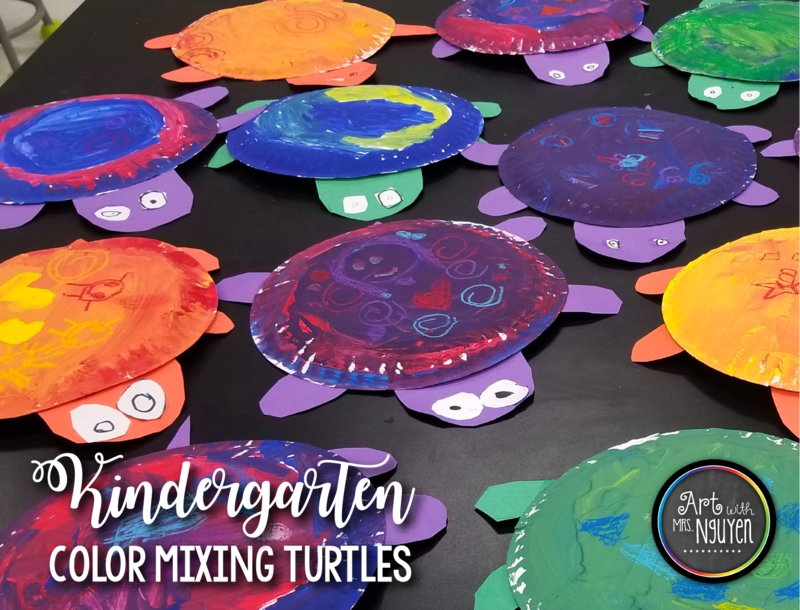 You can mix them together to make secondary colors! We also briefly talked about those in-between intermediate/tertiary colors (though I don't call them that just yet). 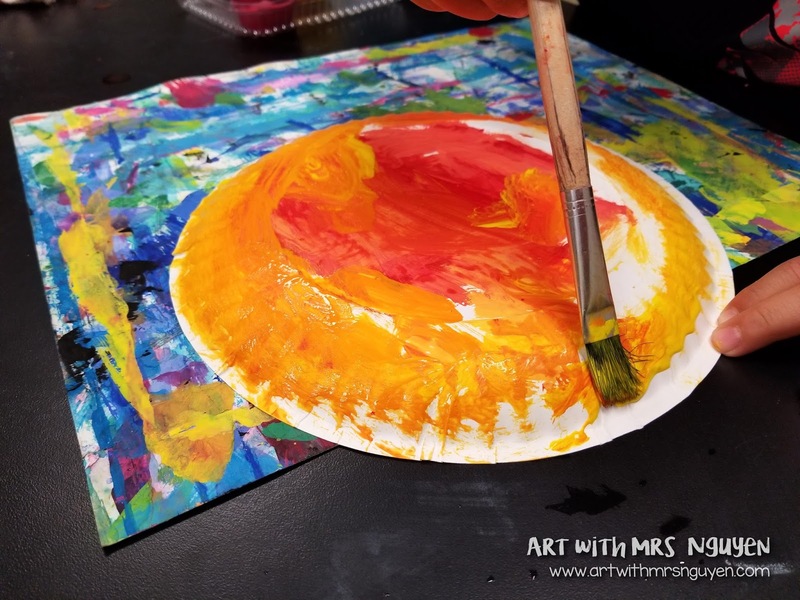 We basically just talk about how you can make different types of individual secondary colors by adding more or less of a particular primary color when mixing the paint. 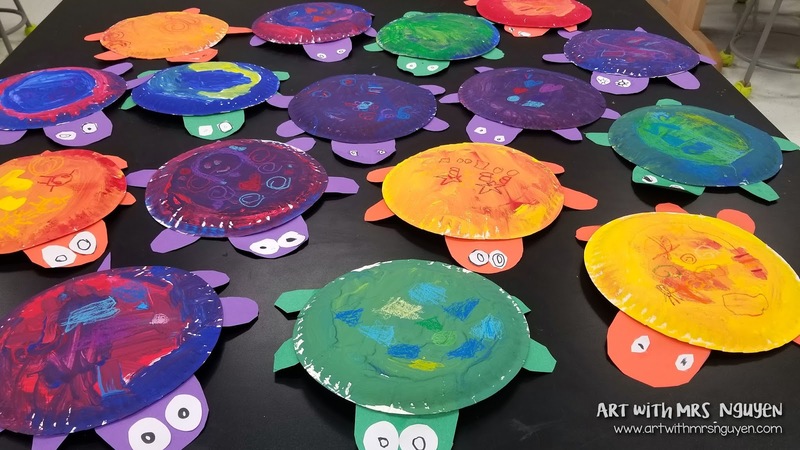 Once they picked their color they were put into groups with other students who also chose to paint the same secondary color, and then given two cups of primary colored paint to get started. "Mrs. Nguyen!!!! Look at my purple!" "Look!!!! 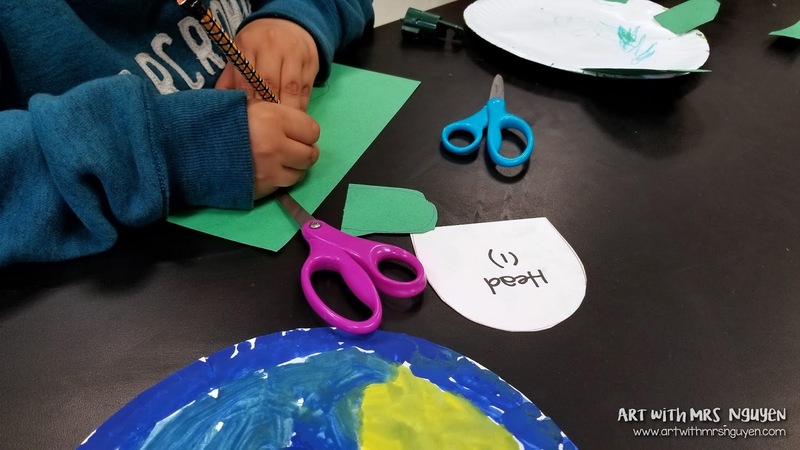 I made green!!" "Our water bucket is orange!!" Once they finished painting their plates, we put them up in the drying rack until the next day. On the second day I had my students sitting in the same groups as the day before and gave each table a box of oil pastels. I asked them to work as a team to pull out the pastels that matched the colors they used and made the day before. So if they were mixing green, they were to take out the yellows, blues, and greens from the box. 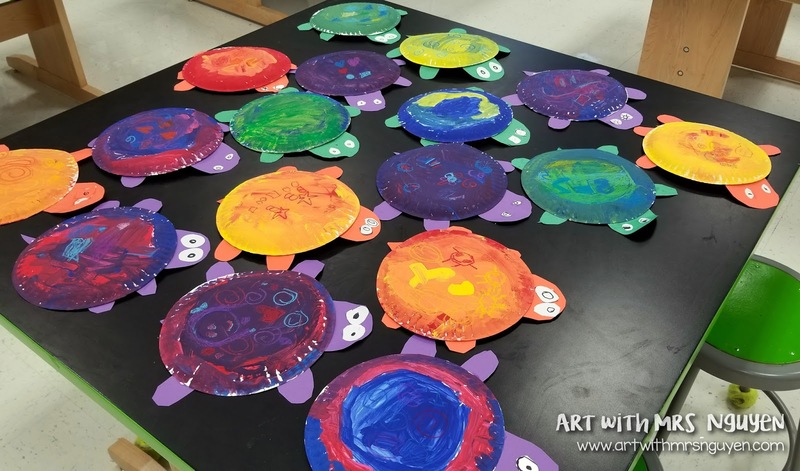 Then they used these oil pastels to add some pattern to their turtle's shells. 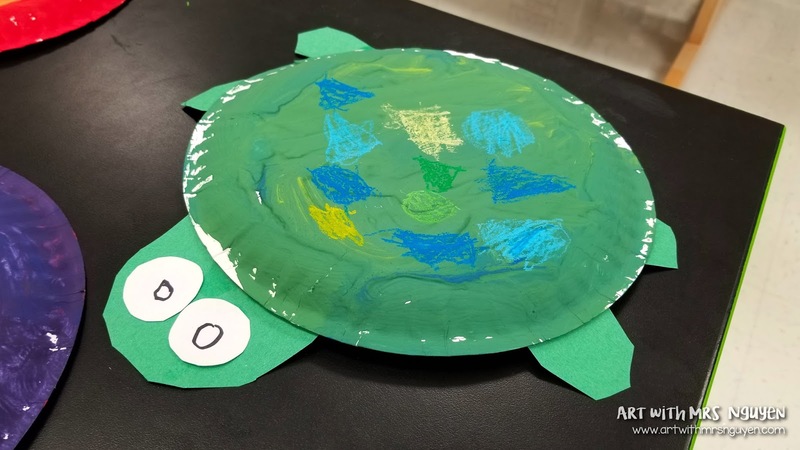 Next they got a sheet of 6"x9" construction paper that matched their secondary color and then used tracers to create the head and legs for their turtle. 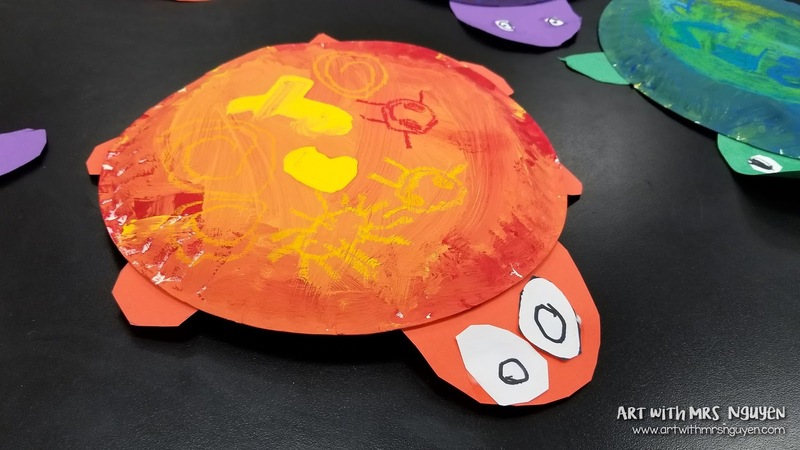 After carefully cutting the pieces out, they added a line of liquid glue to the straight edge side and then attached it to the back of their turtle. Finally, they cut out eyes from a white piece of paper and used sharpie to draw the pupils. I'm sure some people might look at this project and think.. hmmm.. this seems pretty crafty and not so art educationy (a common thought when a paper plate is used in an art lesson). And to that I say ehhhhhhhhh. My students reinforced their learning about primary and secondary colors, mixed their own paints, experimented with using oil pastels, continued refining their fine motor skills by tracing and then cutting out rounded shapes and figuring out how hard to squeeze the glue bottle to apply an adequate (and not insane amount) of liquid glue. I'd say this project was packed with visual arts learning! 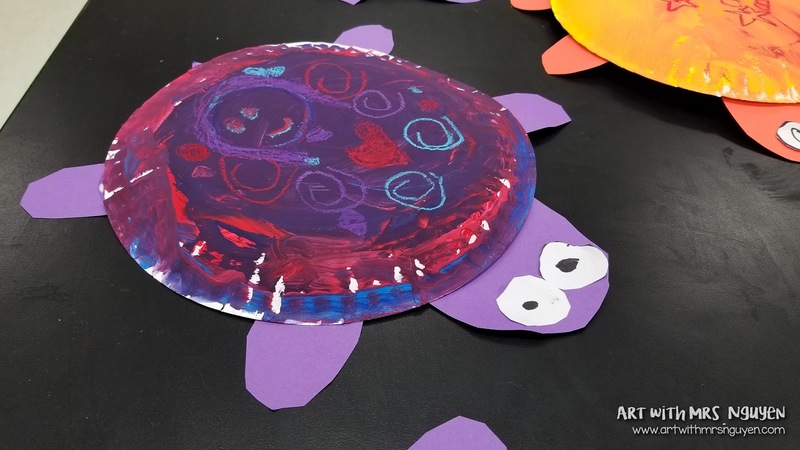 Best of all - my kinders LOVED what they made! This will definitely by a project I repeat for years to come!